Everlasting Imagination: Happy Reformation Day! On this day, October 31st, almost 450 years ago, something absolutely terrifying occurred... Well, terrifying for the Roman-Catholic church at least. You see, today is the day that Martin Luther nailed his Ninety-Five Theses to the door of Castle Church. Martin Luther was born November 10th in 1483 in Germany to Hans and Margarethe Luther. He was their oldest son, with 3 brothers and 4 sisters following after. Of his siblings, he was particularly close to Jacob who died before reaching adulthood. Only one of his three brothers, James Luther, lived past childhood. When Martin Luther was a young man, his father wanted him to become lawyer. He went to school around the age of seven (he later compared attending the school to being trapped in purgatory or hell). Later on, he went to law school, but when a thunderstorm struck while he was on the road, his life took a different turn. Without shelter and nearly petrified with fear by the lightning, he cried out, making a vow to Saint Anna that he would become a monk if he was spared from death. Obviously he did live and he was true to his word. He sold his law books and became an Augustinian friar. He was a very devout monk, frequently fasting and praying, though soon he began to fall into a spiritual despair. His superior ordered him into academic career, hoping that more work would distract his troubled mind. Luther became a priest and taught at the University of Wittenberg in 1508. In 1516 he encountered John Tetzel, who had been sent to Germany to collect indulgences--money they paid to the pope so that he would grant forgiveness for their sins. Luther was disgusted by this practice of selling indulgences and on October 31st (the Catholic All-Saints Day Eve), 1517, he had had enough. He wrote his Bishop, Albert of Mainz sending him a copy of his Ninety-Five Theses in protest of indulgence-selling (as well as many other practices of the Roman-Catholic Church). The same day, he nailed his Ninety-Five Theses to the door of Castle Church or the Church of All Saints. So began the long battle between the protestant reformers and Roman-Catholicism. 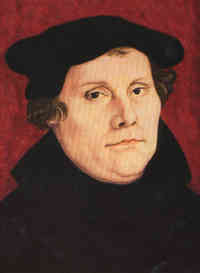 His actions sparked the beginning of the great Reformation and the Protestant church. During his life, Luther translated the Bible into German, and wrote many hymns. He was married to Katherine Von Bora (an escaped nun) in 1523 and together they had six children. Thanks to Luther, people learned of God's grace and were freed from the guilt that drove them to buy indulgences as "payment" for sins. Luther died in February of 1546, but the Protestant church lives on. Here is a scene from the movie Luther, where the Catholic church calls him to recant (take back) what he had written. Haha! I have the perfect link for you! Last year (2011 that is), all of us girl entered the Lighthouse History Contest and Moira's group had to do a report on Martin Luther. And she decided to make a comedy :). Awesome! :) Thanks for the link, Bella!